Energy Matters now offers Flex solar panels from one of the largest solar manufacturers outside of China, Flex. Flex has headquarters in California, with state-of-the-art manufacturing and design hubs across 30 countries. It is an internationally trusted company that has produced millions of solar panels for many of the top-tier solar brands we see in the market today. Flex has a strong and unrivalled background in developing renewable energy technology. The company’s capabilities include design, engineering, manufacturing and worldwide logistics. Flex solar panels work with the latest technology, including the PowerPlay system. They work seamlessly with other Flex products, such as Flex inverters, monitors and the energy hub. Notwithstanding that, they are also compatible with other leading solar brands, including carefully selected inverter and battery products. The range of quality Flex solar panels include Poly and Monocrystalline models. All modules come with advanced quality solar cells that are free from Potential Induced Degradation (PID), meaning they won’t degrade over time. They also feature low glare anti-reflective coated (ARC) tempered glass that provides excellent performance in low light and easy cleaning. 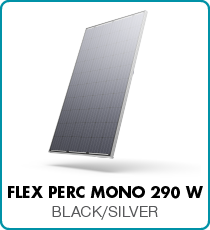 The Flex Monocrystalline panels boast high-efficiency. They incorporate Passive Emitter Rear Cell (PERC) technology that enables the solar cells to maximise power output per square metre. The panels do this by capturing sunlight from the rear as well as the front of the cell. What do Flex solar panels look like? 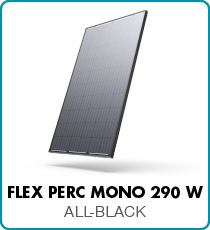 For enhanced aesthetic appeal, Flex PERC Mono panels come in either black with a silver frame and white back sheet, or in the new all-black model. 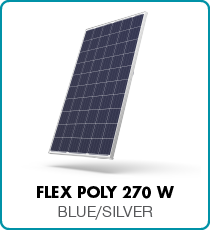 Flex Polycrystalline solar panels are available in traditional blue with silver frame, or the new all-black model. How long do Flex solar panels last? All Flex solar panels receive extreme weather-testing beyond industry standards and are an ideal choice for Australia’s harsh climate. 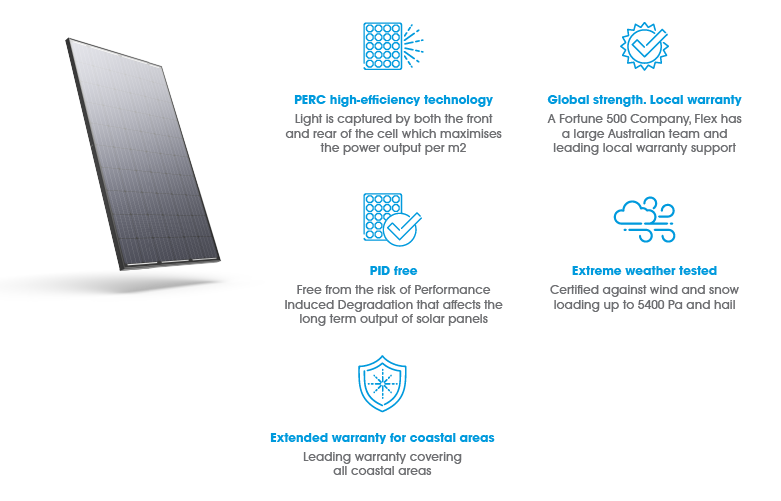 While most solar panel warranties exclude coastal areas due to the corrosive nature of salt and sea mist, Flex extends its solar panel warranty to cover these areas. This is proof of their resilience and quality. All Flex solar panels come with a 12 year manufacturer’s warranty and a 25 year performance guarantee. The company’s Australian offices provide peace of mind when it comes to dealing with any warranty issues.